I bought a couple of Rose Quartz beads ($63 USD) a while back and have really been enjoying them. I find they work well with peachy pink bracelets. 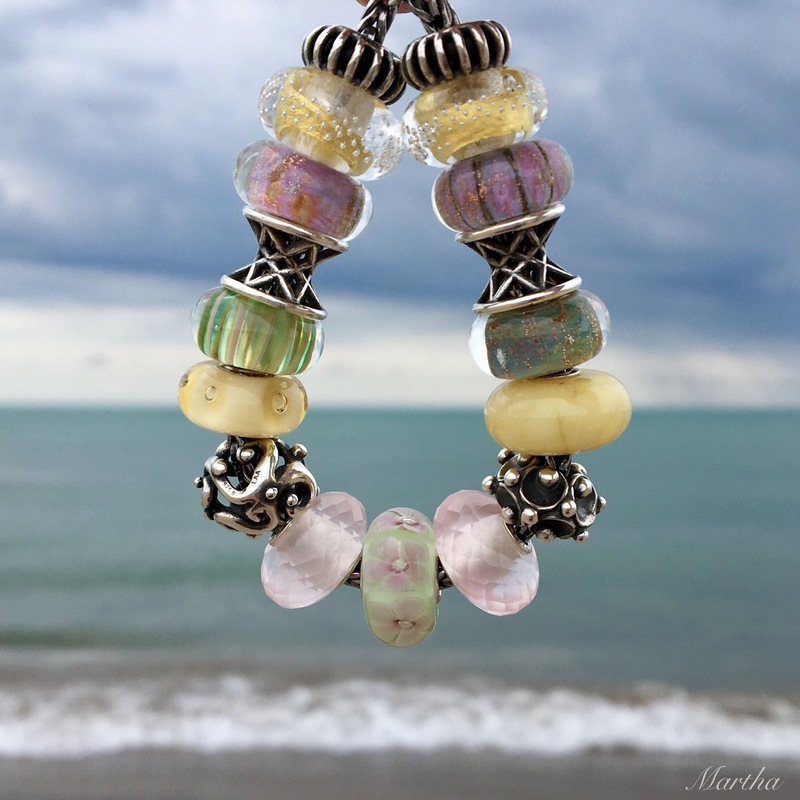 Here, the Pink Prisms set the tone, but the light bouncing off them plays off of the facets of the Rose Quartzes. The Blossom Shade on the right pulls it all together, with its coppery glitter and pale pink at the core. 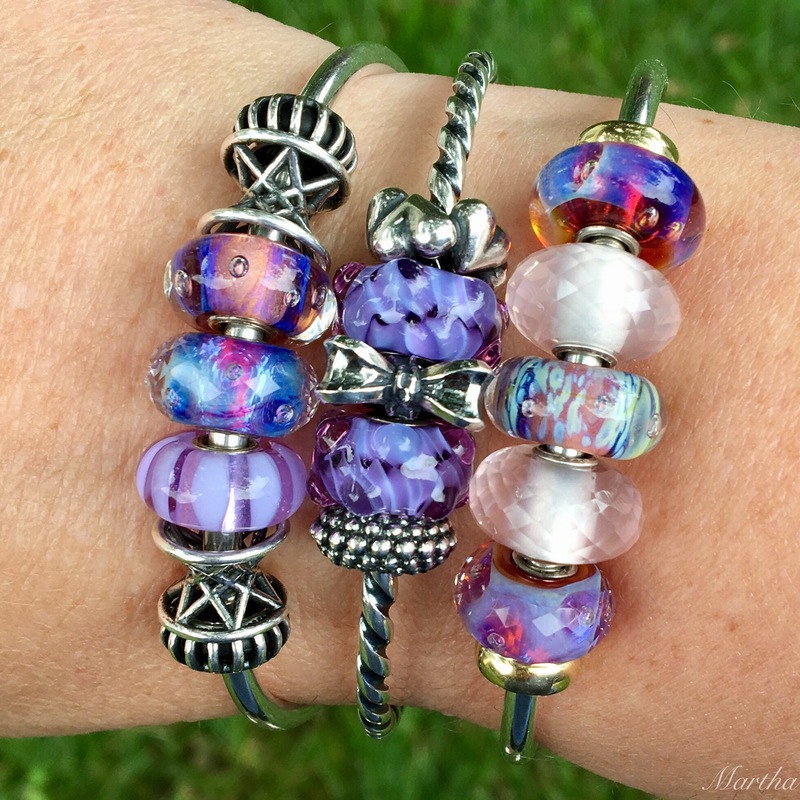 The Rose Quartzes also blend in nicely with purples. 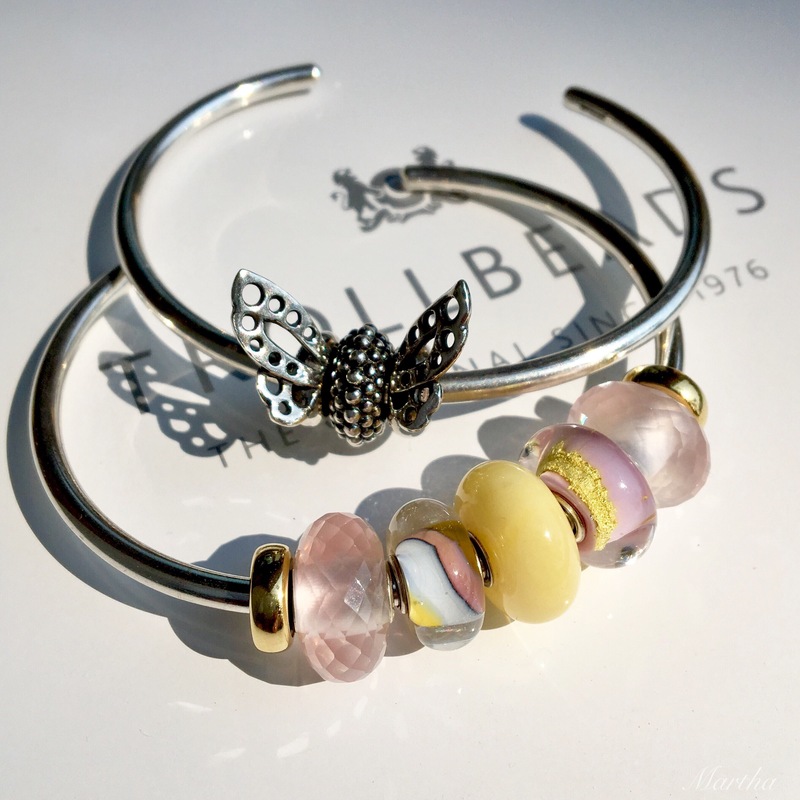 On the bangle below right, the Moonlight Bubbles is the key, with the pale pink and blue tones matching the Rose Quartzes and the Faceted Aurora on the left bangle. That is a very special bead, with its vibrant indigo colour! Next I’ll move over to pink with yellow. The buttery yellow of the amber looks delicious with the pale pinks and greens. The Pastel Flower in the middle is a bead I’ve been wanting for ages and I bought it on our recent trip. Our next trip in a couple of weeks will be camping and there won’t be any bead buying then! 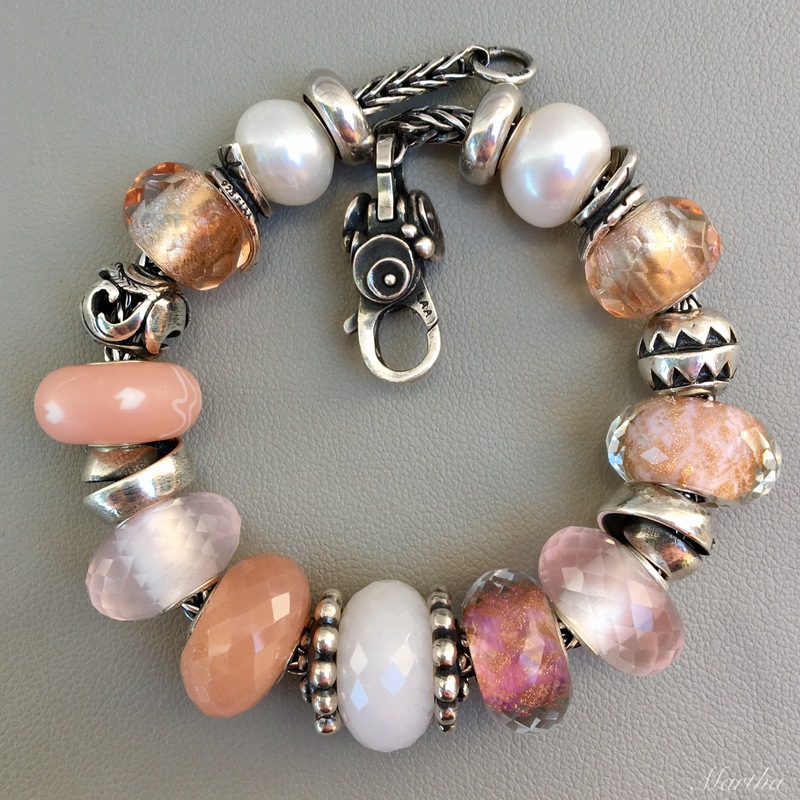 The Rose Quartz beads can make an elegant bangle. 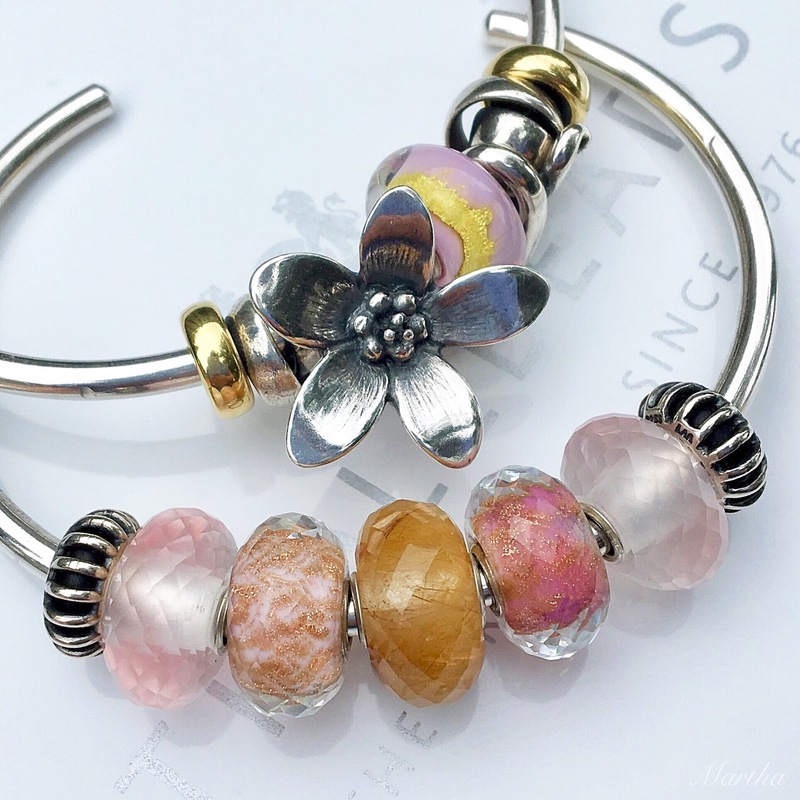 Here I’ve put it with a Blossom Shade, a Golden Rutilated Quartz and a Pink Delight Facet Bead. In the setting sun the Dancing Butterfly Spacers cast a sweet shadow. Lastly, I made up an all pink bracelet for another trip to the beach. I really like how the light hit these and they appear to be glowing. 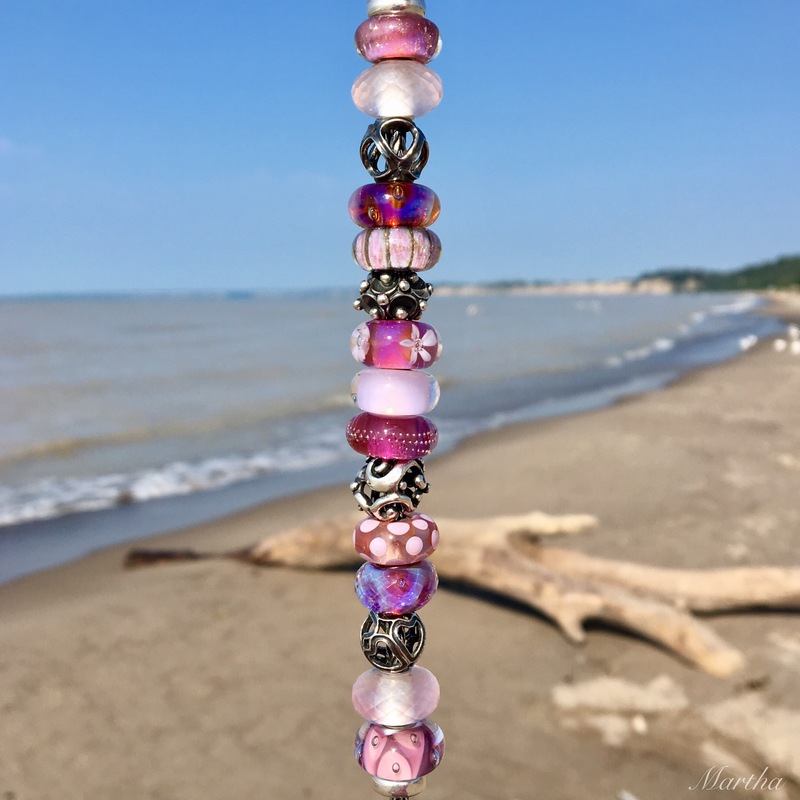 The pink bead on the bottom was one I picked up in a sale and it’s called Baby Girl Bead. Here’s a last look. 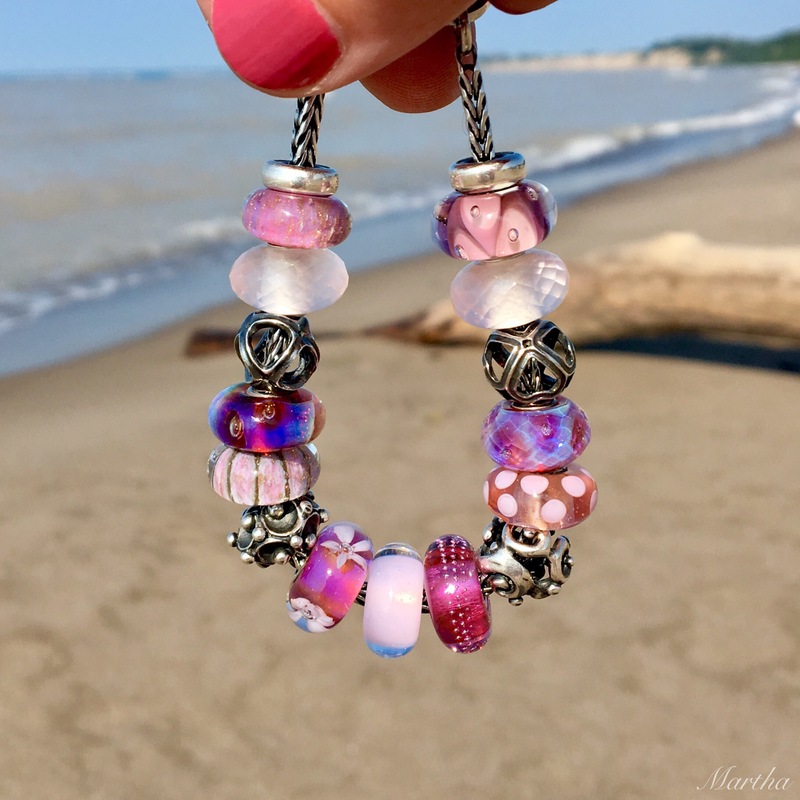 I’m so pleased with these and hope you’ve enjoyed a look at these beads! This blog post contains some product samples and an affiliate ad link. Hi Marisa! I just love these Rose Quartzes and as you can see, have used them a LOT, ha ha ha. Glad you liked the pink and yellow! Hi Lydia! Yes, I’ve been wanting that Pastel Flower for a couple of years, I think! The prisms are awesome. My friend just bought a Denim one and a single dark brown leather bracelet. Take a look at those online as I think they will make a fabulous combo. We are going camping in NY State near a place called Watkins Glen-hope it’s nice! I love your different combinations. Your bracelets are really lovely. Your collection of stones sounds lovely! Buying it pairs would definitely get expensive. I also like the Pink Prism in the Magic Bow! I must get that out! 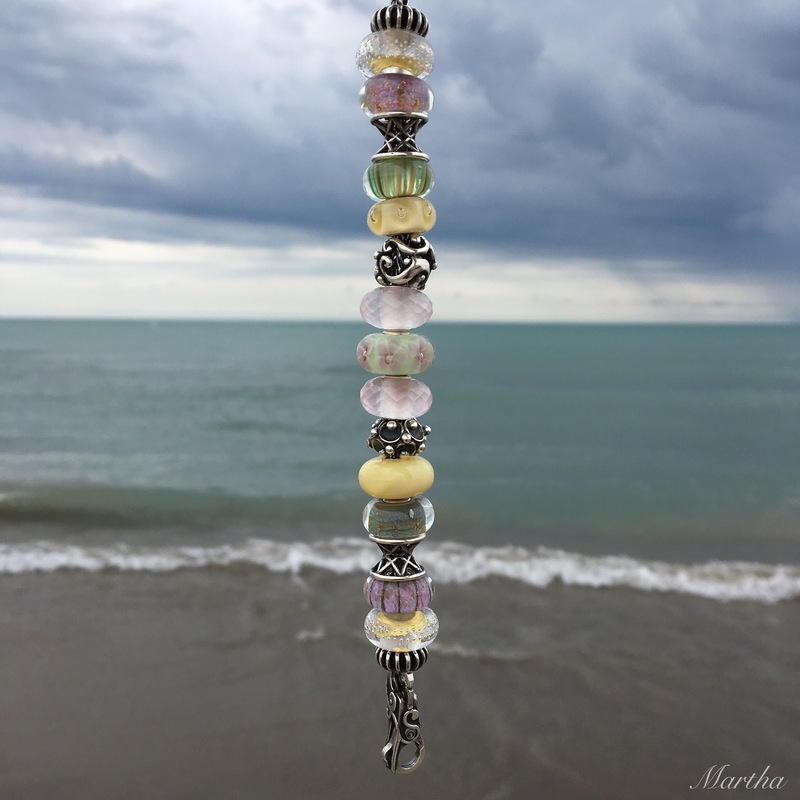 Hi Martha, I love the first bracelet that you did! I’ve been saying it for a while now, but I really must get some Prisms! And I’m also going to have to add the Pastel Flower to my list. That bead is new to me and it’s very pretty. One bead that I absolutely, positively did not want to get was the Golden Rutilated Quartz. But now…. I guess I have seen it too many times and I am afraid I’m starting to like it a little too much. One thing though is I would have to do a live image purchase because I prefer the really dark ones. Hi Suzanne! Yes, if you get a Golden Rutilated Quartz you would definitely want to pick it out. I just love this one with pink. An Instagram friend kept showing the Pastel Flower and then when I saw one in person I knew I wanted to buy it. It’s so pretty and delicate looking! Love your combos, Martha. The pink, green and yellow one is my favorite. I’ve been enjoying your beach photos this summer. I’m not sure what you mean? 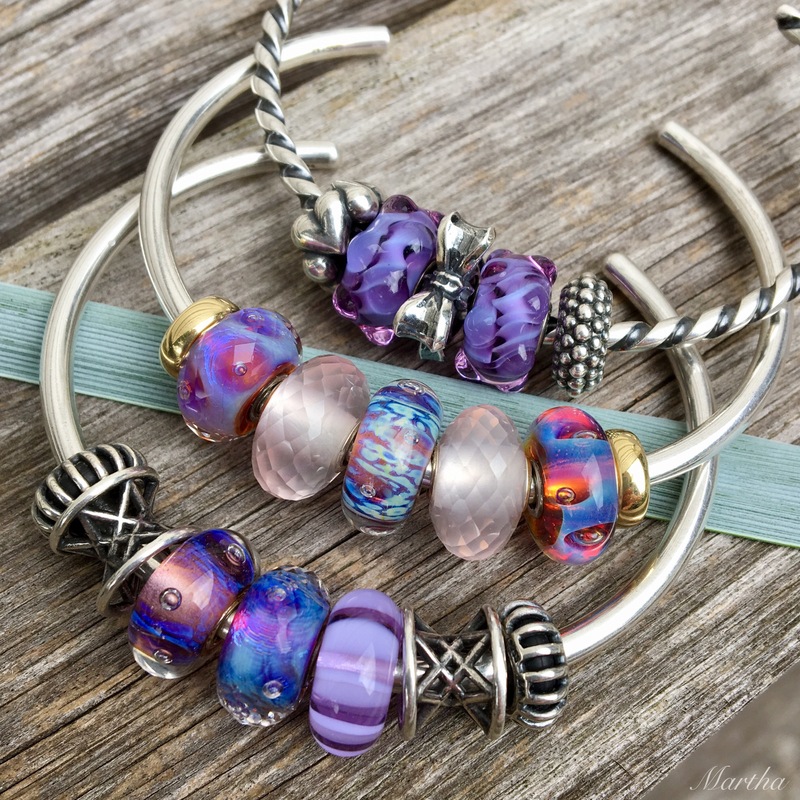 Are you looking at Trollbeads rings?